On March 23, 2018, at 10:40 am, Deputies with the Montgomery County Sheriff’s Office were dispatched to the Subway Restaurant, which is located inside Wal-Mart at 20310 US Hwy 59 New Caney, Texas in reference to a theft. Deputies arrived and met with management of the Subway Restaurant who advised the following. Deputies learned that a Subway employee was transferring product from a Wal-Mart shopping cart into her vehicle to take to another Subway Store. The Subway employee placed a blue chase money bag which contained a large sum of money as well as receipts and documents showing the money belonged to Subway inside the cart. The Subway employee transferred the products from the cart to her vehicle, but left the chase money bag inside the cart after she returned the cart to the cart rack at the front of the Wal-Mart store. Once the Subway employee arrived at the other Subway Store she realized she didn’t have the money bag and had left it in the cart. The Subway employee returned to the Wal-Mart but was unable to find the money bag, at which time the Sheriff’s Office and Wal-Mart management was contacted. 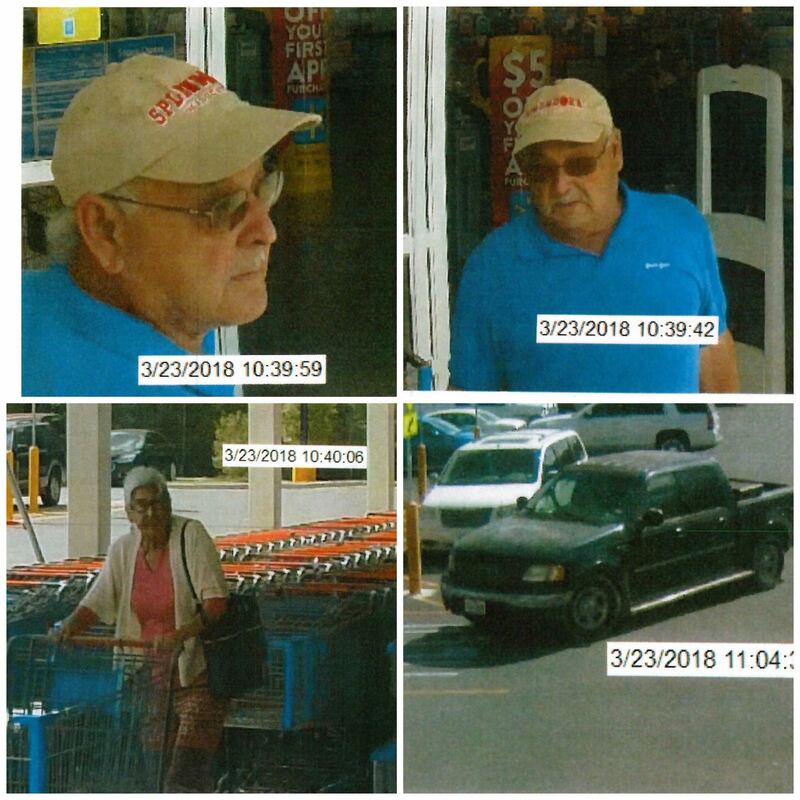 Deputies reviewed the video surveillance, at which time Deputies observed an older white male wearing a blue shirt, a tan Splendora Wildcats hat and blue jeans pick up the blue money bag and carry it to his vehicle. The male suspect is seen retrieving the money bag from the cart at which time he opens the money bag. The male instead of returning the money to Subway or notifying law enforcement takes the money bag to his vehicle, which is described as a dark colored Ford F150. The male suspect was with an older female who pointed out the money bag was in the cart to the white male suspect when he took it. The Montgomery County Sheriff’s Office is seeking the public’s help in identifying the persons in the attached photo and video. If you recognize these individuals please contact the Montgomery County Sheriff’s Office at 936-760-5800 and refer to case# 18A079199.